Explore the lore and the lure of the Rideau with this engaging and colourful chronicle, beginning with Champlain’s “guided” visit in 1615, and covering the 1890s to the 21st century. It sweeps up the Rideau Corridor from Battersea to Ottawa, including Charleston and the Beverley Lakes. The story unfolds: the early days; catching fish; a guide’s life; legendary guides; legendary clients; legendary fish; skiffs and motors. Much of this is in their own words, illustrated by their own photos. 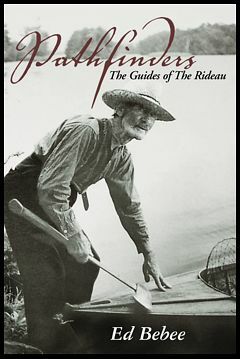 Appendices cover: early fishing tackle; conservation; guides’ associations; a list of known guides; an explanation of tales about early inboard engines; tested and true shore dinner recipes. Anyone interested in fishing or in overlooked Canadian history will find this book enlightening and entertaining. Those intrigued by the social history and cultural fabric of the Rideau will discover an unsung group of men and women who contributed to its flowering. The book is a labour of love by Ed Bebee, an avid fisherman since his youth on Loughborough Lake. Knowing some of the guides personally spurred him to travel the Rideau Corridor, talking to other guides and to anyone connected with guides and guiding. Friends of the Rideau has published the book as part of an ongoing effort to bring to light fading or forgotten narratives of the “not so rich and famous”. Friends of the Rideau is a non-profit group dedicated to promoting and enhancing the beautiful Rideau Waterway – a National Historic Site of Canada, a Canadian Heritage River, and a candidate for World Heritage Site recognition. This book is currently available for purchase at the fine retailers along the Rideau. Proceeds from sales go to Friends of the Rideau. For info on where to purchase the book see the Sales Page. "Congratulations on a fine book .... You certainly managed to remind me of many colourful fishing figures of the past. I believe it will be an eye-opener to those who read it.... Thanks again for a great read!!!" - D.W.
" Thank you so much for the book. I received it yesterday & have already read every word. You did an excellent job - congratulations! I enjoyed, too, the stories of other guides in other places." - T.F.
" You have done a great job and it flows nicely." - L.Y. Retailers please contact Friends of the Rideau for wholesale information.